The British Journal of Neuroscience Nursing BJNN is now the official journal of BANN. 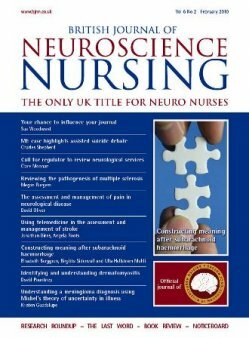 This peer-review journal is the only neuroscience nursing journal in the UK, providing professional, educational and research articles in the field of neuroscience practice. The best clinical articles available to neuroscience nurses, covering areas ranging from neurosurgery and critical care to neurological conditions including MS, Parkinson's, stroke and epilepsy. Reports of innovations in practice, service development pilots and audits developing the roles of neuroscience nurses. Insights into the physiology and incidence of rarer neurological conditions or unusual aspects of treating more common conditions. A summary of all the latest neuroscience research findings published in other journals. The BJNN is managed by the BJNN Editorial Board. The BJNN Editorial Board invites you to submit your manuscripts for consideration. Click here for additional information.